Many would have come across some smoke detectors that indicates to be safe in and around the home but what makes this new smoke detector an exception from the average ones? the problem by sending a message set by the user to up to 4 cell phone numbers even your not at home or not hooked with central monitoring system. 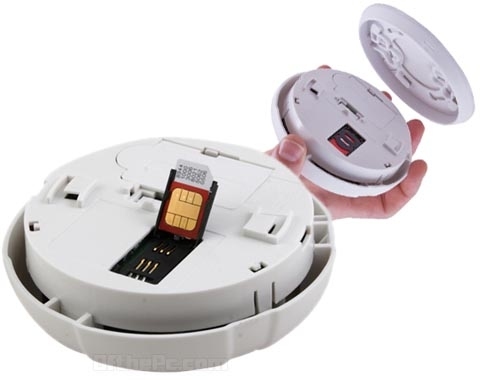 The Firetext Smoke Alarm which looks like an average smoke detector has an extra slot inside that supports a SIM card, like cell phone. And Alarms when it detects smoke. The manufacture which stats 15% of house fires in the UK happen in vacant properties assures that their product will help aware of the situation before it's too late if residents are out of the house. The Firetext Smoke Alarm which costs £89.99 ($139 CAD) should last about 2 to 4 years on one 9V lithium battery, with normal usage, available at Firetext.